Text with a light green backround color indicates links added since Summer 2001. ®TMark -- WHAT will they think of next? ®TMark is a brokerage that benefits from "limited liability" just like any other corporation; using this principle, ®TMark supports the sabotage (informative alteration) of corporate products, from dolls and children's learning tools to electronic action games, by channelling funds from investors to workers for specific projects grouped into "mutual funds." ®TMark is indeed just a corporation, and benefits from corporate protections, but unlike every other corporation, its "bottom line" is to improve culture, rather than its own pocketbook; it seeks cultural profit, not financial. For starters, see The Mutual Fund Model, Curation, and Frequently Asked Questions. The Corporate Law Fund -- The projects in this fund challenge the legal rights and powers that corporations have arrogated over the years. Many of these projects focus on corporations' status as full persons, obtained via an 1886 U.S. Supreme Court--SANTA CLARA COUNTY v. SOUTHERN PAC. R. CO., 118 U.S. 394--ruling based on the Fourteenth Amendment to the U.S. Constitution, which was ratified to protect the rights of freed slaves. The Biological Property Fund -- The projects in this fund are aimed at corporations that scavenge the earth's biomes and human bodies for valuable genes, with only the most mercenary consideration for the long term social, health and environmental consequences of their actions. Some of these projects focus on the well-known dangers of letting corporations steer and shape scientific research. Other projects call attention to the way that biotechnology P.R. shifts public attention away from corporate damage to the environment and society by brandishing absurdly simplistic solutions, e.g. "better genes" that in fact only benefit corporations. The Intellectual Property Fund -- This is a stable and reliable fund with a diversity of risk, specifically tailored to the youth market, and all projects focus on copyright and trademark issues. The Intellectual Property Fund is managed by Negativland, who have an extensive history of activism against copyright abuses and are very strong cultural producers in their own right. The Media Fund -- For reasons of situation, this high-risk fund has tremendous potential yields. The Media Fund is managed by Andrei Codrescu, who has consistently produced oppositional cultural dividends in various contexts, from the poetic to the cinematic. His current position as commentator for National Public Radio completes his exceptional qualifications for this position. was a project of the World Game Institute. What the World Wants presents a 2-dimensional chart measuring 34-by-23 minus 2 little cubes represents "annual costs of various global programs for solving the major human need and environmental problems facing humanity. Each program is the amount needed to accomplish the goal for all in need in the world. Their combined total cost is approximately 30% of the world's total annual military expenditures." 1 cube equals $1 billion. The total chart contains 780 cubes representing annual world military expenditures of $780 billion. Below the chart is the following table. See the complete on the web listing in the Crimes Against Humanity section. Ithaca HOURS Currency, "Local currency is a lot of fun, and it's legal"
Other Hours Cities - find one near you - LARGE compendium, irreplaceable! Information on Ithaca HOURs is also available in Espanol (Spanish), Deutsch (German), Francais (French), Turkce (Turkish), Suomalainen (Finnish), Svenska (Swedish), Portuguese, Nihhon-go (Japanese), and Zhong-Wen (Chinese, 100k). Global Resource Bank, the people's bank of ecosystems. A transparent clearinghouse for a sustainable global economy. "In order for democracy to work, people have to find time to take an active, informed part." For five decades, humanity has been hoodwinked by the most poisonous confidence trick in history. 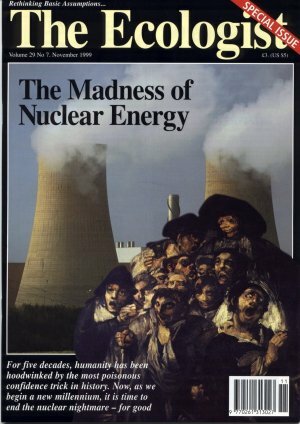 Now, as we begin a new millennium, it is time to end the nuclear nightmare - for good. Trident Ploughshares 2000, a mass nuclear ploughshares action at Faslane in Scotland. "Science is not bad, but there is bad science. Genetic engineering is bad science working with big business for quick profit against the public good." RH the Prince of Wales, who farms organically, says the genetic modification of crops is taking mankind into realms that belong to God, and God alone. Compiled by Dr Ron Epstein, Philosophy Dept, College of Humanities, SF State Univ. Campaign To Ban Genetically Engineered Foods MAGNIFICENT Resource! DOT Issues Rules to Make Drivers Licenses into National ID Card. The US Department of Transportation issued a proposed rule on June 16, 1998 requiring that all states issue new drivers licenses that use the SSN, and limit govt transactions to those with appoved id cards. Letter from Rep. Bob Barr (R-GA) and Ron Paul (R-TX) opposing the proposal. Barr and Paul have introduced H.R. 4217, the Freedom and Privacy Restoration Act of 1998 repeals the rules. The Seventh Generation Fund the only Native foundation providing funding, advocacy and capacity building for grassroots Native environmental, social justice and cultural organizations. Adopt A Grandparent Program needs more participants and some computers! Alpha Institute, facilitating positive interaction among world communities. Tricky Envelopes demonstrates their MAHvellous creativity: hempelopes! -- these people have done/are doing/spearheading fabulous work! Hungry Bear Hemp Foods -- highly recommended! Political Ecology Group builds alliances to confront environmental destruction, racism, sexism, homophobia and corporate power. How the System Works (or doesn't) nexus focusing on Corporate Power issues. Economic Policy Institute seeks to broaden the public debate about strategies to achieve a prosperous and fair economy. Fortune 500 "the most important, analytical, one-stop corporate scorebook available anywhere". Mothers and Others Online -- Caring for the earth is as much our personal and community responsibility as caring for our children. Organic Gardening Magazine's "Organic Rules" site. February, 1998: If you care about organic food, you must act now! Seen other recommendable portals? PLEEZE let dave know about it! "Nominated for an Academy Award for 1996 Best Documentary, Tell the Truth and Run, the dramatic story of muckraking journalist George Seldes (1890-1995), is a piercing examination of American journalism. . . .
Tell the Truth and Run raises fundamental questions about the recorded history of the Twentieth Century; about freedom, fairness and diversity in the media; about power and abuse of power; and about public citizenship and the democratic process." Learn about/help expand the PBS campaign to get more stations to screen this film on PBS television. ask if they have plans to broadcast it; if not, urge them to take another look; APS can send screening cassettes to stations upon request. purchase a boxed set of the PBS series through Mono Lake (ML) Bookstore and support the ML Committee's work! The Video Project, Media for a Safe & Sustainable World. The most effective search engine the ratitor has found. NewDeal - Smart Software for the Rest of Us -- Turn ANY PC into a state-of-the-art office or classroom. Open-source software is an idea whose time has finally come. For twenty years it has been building momentum in the technical cultures that built the Internet and the World Wide Web. Now it's breaking out into the commercial world, and that's changing all the rules. Are you ready? Linux, an independent POSIX implementation and includes true multitasking, virtual memory, shared libraries, demand loading, proper memory management, TCP/IP networking, and other features consistent with Unix-type systems. Linux Router Project, "networking-centric micro-distribution of Linux"
Tom's Root/Boot disk, "The most Linux on 1 floppy disk"
GNU, a complete free Unix-like operating system. Perl Routines to Manipulate CGI input, a "CGI-lib" of sorts to decode forms. About HTML section from "Subjective Electronic Information Repository"
Perl tools providing a host of converter utilities, etc. and Oceanographic & Meteorological models. Political Leaders (1945-1996) -- chronological listing of contemporary rulers from 179 countries and 3 organizations. fedworld -- "one-stop location for the public to locate, order and have delivered to them, U.S. Government information"
Zappa bits, #2: The Black Page!